It is a good thing that we don’t have to judge everything we do by how much the activity produces. 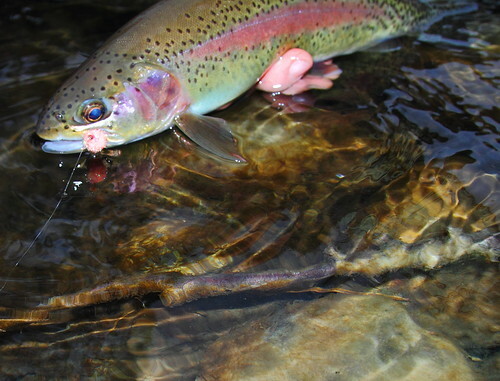 If this were the case, steelhead fishing in December and January would often be viewed as “wasted” days. If production were the only concern we would also only visit the most productive rivers. We would not visit the small out of the way places such as the Wenaha. The Wenaha requires more effort for sure. You do not get to drive along, pulling off the side of the road to fish the easy spots and then drive some more. At a minimum on the Wenaha you have to walk up the trail. If you stick to the trail and the easy offshoots to the river, you will only get to see a small amount of the Wenaha. If you really want to enjoy the Wenaha you should be ready to wade the river and fight a little brush. It is no secret that the Wenaha is close to my heart. Although the Walla Walla River runs only a ¼ mile from my house, I consider the Wenaha my home water. Some of the things I value most are the things I have to work for the hardest. Often the toil required to get somewhere provides enough of a sense of satisfaction that any other benefits I gain from my work are just a bonus. To put it simply, the Wenaha does not reward the lazy. And like any good water, many of its secrets will only be revealed with many hours, days, and even seasons of plying its water. The Wenaha provides everything to me that the modern world doesn’t; solitude, simplicity, and reward for hard work. I felt a little like a kid at Christmas yesterday morning, giddy with anticipation as I headed to the Wenaha. Few other rivers do this to me. Even if I only walk the river, I feel right with the world when I walk in that canyon. I am just a small pawn walking among the giant rock hoodoos with the canyon towering above and around me. In this setting I know that and am ok with it. I have my place. My place for the day was simply walking, wading, and catching a few smallish rainbows. No bull trout or steelhead joined me for the day. I was content though. 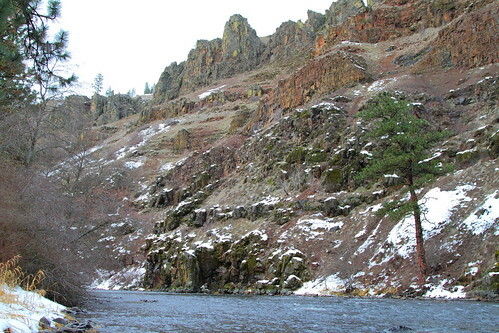 I do not head to the Wenaha in the winter with the singular intent to catch steelhead. I head there in the winter to replenish my mind and body and with hopes of deepening my understanding of this river. I have spent the least amount of time on the lower six miles of river. This is the section that is not a designated Wilderness area. In the summer it is too hot for bull trout and I spend all my time upstream inside the Wilderness boundaries. With short December days darkness always come quicker than I think it should and today was no different. I was upstream about three miles when I realized the sky was getting darker. It had kind of snuck up on me. I felt like I was still just getting started, but I only had about 20 minutes of light left. Reluctantly I reeled in my line and climbed the canyon wall to the trail. 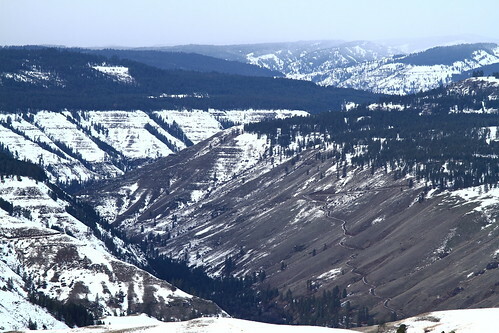 This morning I had parked at the Grizzly Flats camping area on the south side of the river. The trail is on the north side and there is another parking area part way up the canyon wall on that side. I had parked on the other side because I wanted to start fishing the river right there and work my way upstream. Now that it was becoming apparent that I would be walking much of the way back in the dark, I was really wishing that I had parked at the trailhead because now I was going to have to wade the river in the dark as well and there aren’t any real easy spots to wade near where I parked. You can make it across them in the light with some difficulty, but it is heavy pocket water with big boulders everywhere to trip you up and surprise you with much deeper water than you expect. The trail on this lower section of river is often above the river some distance. As you get closer to the parking area the trail dips back down to the river one last time before climbing the wall of the canyon to the parking area. Once you get up off the river in this section there is no real good path back down, especially in the dark. So I decided to try and walk along the river for the last bit instead. I tripped and stumbled my way along the river in the darkness. The snow made it much easier to see in the dark, but the bare tree and brush limbs at head level seemed to be invisible as I continually walked right into them. I eventually fumbled my way through the darkness and limbs. The last barrier between me and my Explorer was the dark river splashing over big boulders. I eased into the river and carefully felt my way across the river with my feet. What a relief to get across in the dark without falling. The river is not big enough this time of year to be a real danger, but I really didn’t want to get a good soaking on a cold December evening. The last time I waded in the dark was close to two miles on Joseph Creek and that wasn’t any fun either. As I walked back to my rig, I again reminded myself that I should avoid wading rivers in the dark. Hopefully I will remember better next time. Hey Grant, nice post. I haven’t gotten to do any fishing lately, so reading about someone I know doing it feels good. Will. Grant, fantastic website and trip details! Enough to make we want to drive down from Spokane to fish and camp in your area. I’ll be on the Wenaha this coming weekend. I’m an avid fisherman but a rookie when it comes to flyfishing. Yes, I have caught fish on my fly rod but it was some pretty simple stuff. My question is whether I should pack along the rod or not for this weekend. I’m assuming you’d reply YES! but thought I’d ask anyway. Considering the out of state license I need to purchase, plus the weight of the equipment, plus the short amount of time I have due to all the hiking…..in that context are their fish to be caught this time of year or would it be better to just enjoy the scenery this time around? I would pack my rod. My wife went by the mouth of the Wenaha at Troy Saturday and she said it was running pretty clear, but there is no guarantee this time of year. The river probably wont be wadeable so I would start from Troy or go in the Three Forks Trail. You don’t need anything too fancy to catch fish there. If I were to take only three flies they would be an olive woolly bugger (no flash necessary), a copper john, and some flashback stoneflies. Let me add a fourth, throw half a dozen orange stimulators in there as well. With the nymphs, don’t be afraid to fish deeper if you aren’t catching anything, and if dead drifting doesn’t catch a fish where you know a fish is, retrieve your fly through that spot no matter what fly you are fishing. I hope that helps. Also, the bottom mile of the river is mostly riffles and pocket water. Better water begins a mile or so upstream of Troy.